Sunway TES has been selected as the Centre for Accountancy Excellence (CAE) by the Government via PEMANDU under EPP 17, which is aimed at transforming Malaysia as the leading Accountancy hub in the Asia Pacific region by 2020. This is part of the government’s ongoing Economic Transformation Programme (ETP) projects. Sunway TES with strategic partners will now champion accountancy programmes at the professional level at national stage. The ceremony was officiated by Datuk Prof. Dr. Roziah Omar, Deputy Director General (IPTS), Higher Education Department, Ministry of Education, on behalf of YB Dato’ Seri Idris Jusoh, Minister of Education II. This makes Sunway TES, the only CAE thus far within the Economic Transformation Programme (ETP). Launch of the Sunway TES Centre of Accountancy Excellence – (From left) Lee Weng Keng, Tengku Nurul Azian Tengku Shahriman, Teo Ee Sing and Datuk Prof Dr Roziah Omar. Within a year of its launch, the Sunway Mentoring Programme has become the ‘talk of the town’. 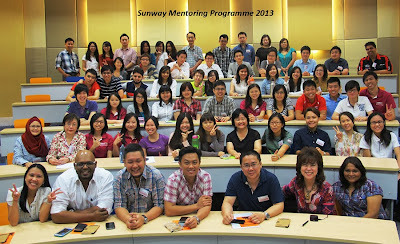 First launched in April this year, a second cohort of undergraduate students eagerly joined the mentoring programme in October 2013 at Sunway University. The programme launched by Ms Elizabeth Lee, Senior Executive Director of Sunway Education Group, is a one-on-one partnership between members of Sunway Alumni and LEAP Platinum students. Selected students, from bachelor’s programmes are chosen in recognition of their strong academic credentials from the various departments of Accounting, Banking and Finance, Marketing, Management, IT and Psychology. The goal of this programme is to groom students, through coaching sessions in real life situations on core competencies in the workplace. By taking students out of their structured daily classroom setting, the aim is to expose them to the constant changing pace of real life situations and to empower them with the skills and knowledge for professional and personal growth. The Sunway Alumni mentors are selected professionals from their respective fields who bring with them a wealth of knowledge and expertise. The mentees, top students of Sunway University are equipped with strong academic credentials and classroom knowledge in their areas of study. The pairing of these two parties is hoped to create a win-win partnership that is essential to the success of the programme.